Dry Fly embraces the farm to bottle approach and believes it is the consumer's right to know what they're drinking, where it came from, and how it was produced. We do not purchase bulk alcohol. We do not source our grains from a variety of producers, compromising consistency and quality. We do not take shortcuts in the distilling process by using inadequate stills or take shortcuts in barrel aging by using additives or employing non-traditional barrel sizing. From grain to glass, we invest in every step of the process and have a passion for what we do because we believe the right way is the only way. We invite you to find a bottle of Dry Fly today and experience true small batch spirits, hand-crafted from the ground up. 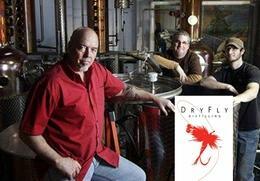 Dry Fly Bourbon 101 was the first legal bourbon ever made in the state of Washington! It features a 60% corn (grown by our local Hutterian Settlement), 20% wheat, and 20% barley mash bill. Aged in 53-gallon barrels for a minimum of 3 years, it has strong corn forward notes.